The big news is that there is a potential Major Application on the cards for Culter. 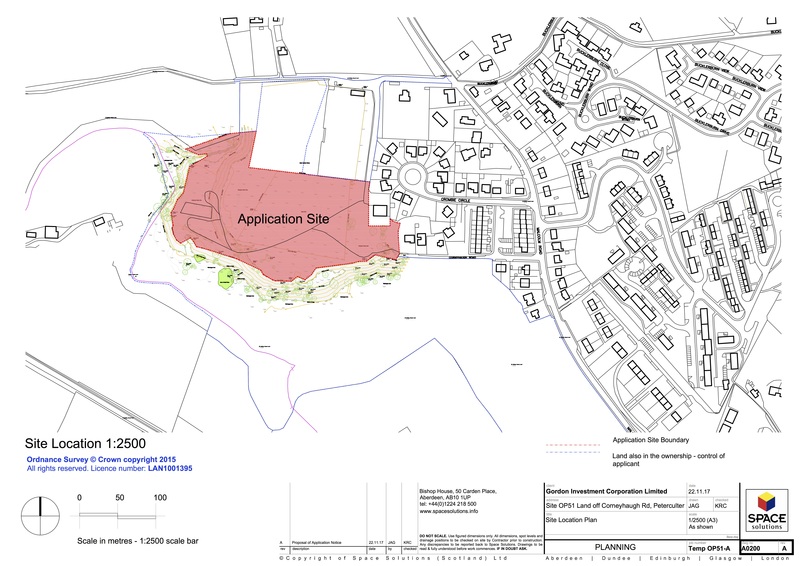 An application has been put in to build up to 150 homes for retirement and special-needs residents for the site on the west side of Culter on the old mill tips reached via Corneyhaugh Road and The Shoddy, both off Malcolm Road. Because this is a Major application, there are two steps at which we the community can put forward our views. The first step requires the developer to consult the community, and to consider the feedback they receive. 90 of you responded to this stage, at or following the public exhibition which was held in the Village Hall on Monday 29 January. The second step is that the developer will make a formal planning application, which is handled just like any other, and we the community get a second opportunity to comment on the proposals. This second stage is run to a legally-defined timetable, and there will be just three weeks from the application being made public until the last day for having your say. In that time, we all need to know the application has been lodged, understand what is proposed (and there can be hundreds of pages of reports and plans to look through), decide what to say in support of or objecting to the proposal, and get your comments to the Council. It is really important that you tell the Council directly what you think. It’s also very helpful to us to hear what you think, but if you only have time to send one letter or email, make sure it goes to the Council! When it comes to the formal planning application, you need to ‘make a representation’ (that means, write to Planning in the Council) – what you said at the public exhibition won’t influence the formal planning application. You can repeat exactly what you said at the public exhibition, or you can add detail or make a different point. You can say Yes developing this site is a great thing for the village But the buildings should be no more than two storeys high in keeping with the existing houses. You can say No, simply too much on too small a site, although if they were to propose fewer houses and more of them for new families then you could live with that. Whatever you think, it really helps Planning if you give them the reasons behind your views. No need for any essays – just clear points showing why you feel the way you do. Is the proposal helpful to Culter as a community? Is the proposal appropriate for the site, with buildings on the same scale as neighbouring housing and not too squashed together? Are the access provisions for cars and for pedestrians good enough, and the local roads able to handle the traffic? Is sufficient attention being paid to preserving the wildlife corridor along the Leuchar Burn? The site is a former mill-waste tip – are there unresolved issues of contamination? Can utilities (water, power, broadband, drainage) cope or would the scheme be acceptable if the developer were to improve these enough? How will the wider services in the community – sports, school, entertainment, social and health care, shops – be affected by the extra residents? In this case, the site is already listed in the Local Development Plan for residential development – so Planning must ignore any points saying the site isn’t right for homes – and they are not allowed to take any notice of possible costs, or fears that your house will be worth less or your views would vanish. All that said, how many homes there are to be on the site, whether the location is appropriate for retirement or special-needs housing, whether the numbers and sizes of buildings are in keeping with the location, are all fine things to comment upon – they are about getting the best residential development on the site for both the neighbours and for Culter. You can make exactly the same points as your friends and neighbours, but get the message across in different words so that Planning cannot lump both responses together and treat them as a single reply. Telephone 01224 523470 or look up https://www.aberdeencity.gov.uk/services/planning-and-building/planning-applications/comment-planning-application#1783 for help. If you feel stuck, contact us via our dedicated email planning@cultercc.org.uk or the contact details on the back of The Courier.